Lyon Eats: Starbucks at Monoprix! "Our coffee buyers love this elegant coffee. With great depth of flavor, a luxurious texture, intriguing cocoa tones and soft nut flavors, it's no wonder." "From the birthplace of coffee comes Sidamo - highly prized by coffee tasters all around the world for its fleeting, floral aroma and bright yet soft finish." Rich, smooth, velvety and woodsy, with a distinct earthiness. No wonder it's our most popular single-origin coffee. We love the heavy, full body and the deep, intense aroma. 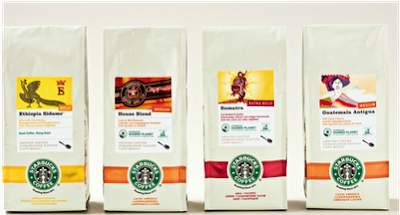 "Starbucks signature blend and our most popular coffee. Ever. Light- to medium-bodied, this deliscious blend of Latin American beans defines the distinctive flavor of Starbucks." Potluck for 'la rentrée'! You're invited!